Casey Stoner’s return to competitive motorcycle racing has lasted less than fifteen minutes, after he ran wide and crashed out at Degnar just minutes into his first run on the MuSHASi RT Honda bike. Taking over from 2014 winner Takumi Takahashi, the team were leading the race when Stoner had his high speed fall on the exit of Degnar 2. Unsettling the front wheel on a bump, he let off the brakes to save a crash, but in the process ran wide onto the grass on the exit. 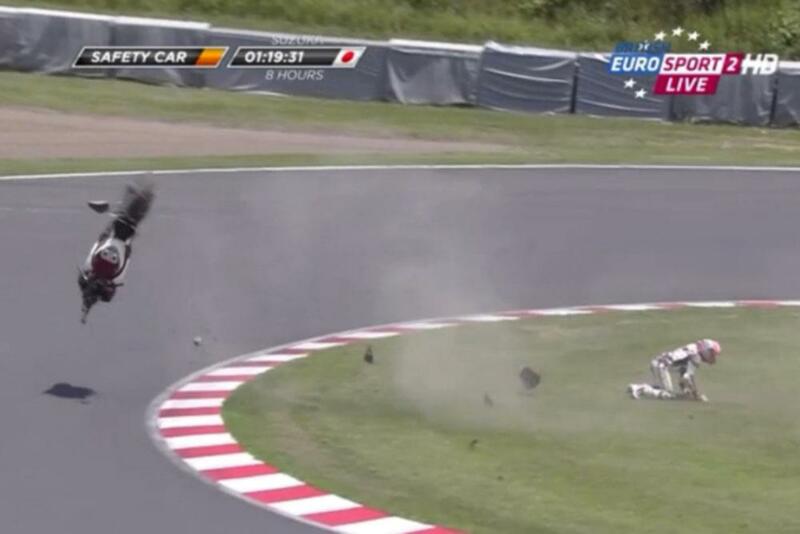 He then tumbled heavily across the grass, initially being tangled with the bike before it cleared away from. Conscious and able to crawl away unassisted, he was subsequently stretchered off the track for further medical assessment. Fellow Australian Josh Hook inherited the lead on the FCC TSR Honda after a safety car deployment, but with Yamaha Factory rider Bradley Smtih only half a second behind him. Update: Stoner has a broken left tibia and right shoulder, but has already returned to the MuSASHi Honda pit garage.